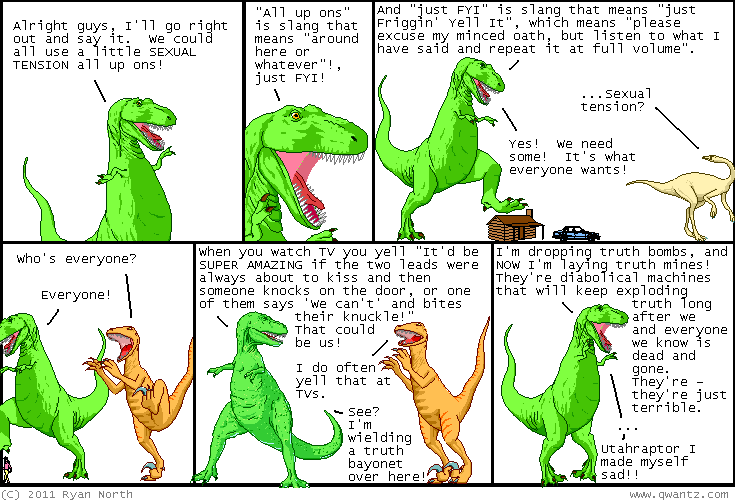 Dinosaur Comics - February 8th, 2011 - awesome fun times! February 8th, 2011: I've been having a lot of fun with BoxCar2D and there's a new version out today! Basically you can set some initial conditions (and choose your track type), and your computer uses a genetic algorithm (before your eyes!) to evolve a car ideally suited to that track, all within your browser. It's amazing to see it start out with such sucky cars, and then come back in a few minutes and see the new cars that are there. Leave it running overnight for ultracars! In this new version you can design your own car, but I prefer to let my computer surprise me with its inventions, watching them as they run the track. BoxCar2D, cats and kittens!